Neoclassical style based on Andrea Palladio's works. Balustrade. salvaged from the John Albright House. See more about Thomas B. Lockwood and his home on "Millionaires' Row"
The original building was the gift of Thomas B. Lockwood (1873-1947) and his wife, Marion Birge Lockwood, in memory of Daniel N. Lockwood and George K. Birge. Thomas Lockwood, a Buffalo attorney, also donated his extensive collection of rare books to the new library. Thomas B. Lockwood was a Buffalo attorney who served on the University Council for 28 years. A legendary book lover, he amassed what was known as the finest collection of rare books, first editions and manuscripts in the region. The Lockwood family generously contributed $400,000 toward the original Lockwood library - now the Health Sciences Library in Abbott Hall on the South Campus. The Lockwood Memorial Library name was placed on the new library, in recognition of the original endowment. The library is the focal point of the campus, much as the Rotunda is at Thomas Jefferson's University of Virginia. Access to this imposing limestone structure is up a long, wide flight of stairs to a massive portico supported by six very tall Ionic columns. Stone balustrades decorate upper portions of the building. The design is particularly lean, but enormously impressive. Lockwood memorial Library, on the South Campus, has been renamed Abbott Hall. The "Lockwood Memorial Library" (Oct. 2012) is now on the North Campus of the University at Buffalo. “Old Lockwood.” This phrase holds special significance for those members of the UB community who recall the building that served as UB’s central campus library from the 1930s until the 1970s. Designed by noted Buffalo architect E.B. Green and built in classic Georgian architectural style, the original Lockwood Memorial Library was an elegant, four-story structure located at the heart of the South Campus. Square in shape, and faced with porticos on each side, the building featured white marble walls, balustrades, columns and a massive set of steps leading up to the main entrance. Construction was made possible due to the generosity of Buffalo attorney Thomas B. Lockwood and his wife, Marion Birge Lockwood, who donated $500,000 in 1929 in memory of their fathers to build a library for UB at a time when the university was just beginning to develop the campus. 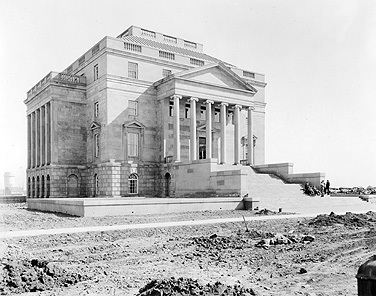 In addition to providing funds for the building, Lockwood also donated his personal collection of rare books and first editions, establishing an impressive foundation for the new library that first opened its doors to UB students and faculty on April 4, 1935. During the library’s formal dedication on May 15, 1935, Chancellor Samuel P. Capen observed: “For every institution of higher learning, the one perennially indispensable possession is a library.” One month later, Philip Brooks, writing in the New York Times, described Lockwood Library as “the last word in institutional luxury,” perhaps in reference to the library’s main reading room, a magnificent replica of a room built for the Earls of Salisbury in early 17th-century England. The spacious reading room in Lockwood featured oak paneling, huge windows that afforded a maximum of natural light and a large fireplace with an intricately carved mantel duplicating one found in England’s Canonbury Tower, dating from 1468. Twin antique chandeliers, salvaged from the Albright mansion, grace the room’s 20-foot-high ceilings. Four decades later, the collection had outgrown its original home, and in 1978, Lockwood Library was relocated to its present location on the North Campus. “Old Lockwood” was renamed in honor of Charles D. Abbott, former director of the University Libraries, and the building underwent extensive renovations during the mid-1980s in preparation for its new role as the home of the UB Health Sciences Library.